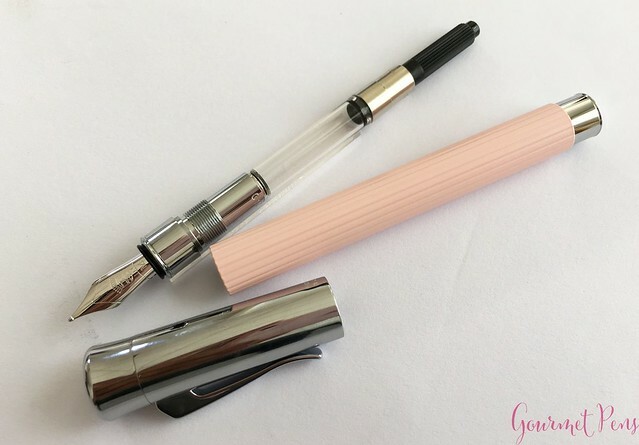 Thank you Pen Boutique for sending this pink pen over for review! Length (uncapped nib-end): 116.7 mm/4.59"
Section Diameter: 10.0 - 11.2 mm/0.39" - 0.44"
The Graf Von Faber-Castell Tamitio is packaged in a slim box with a white cardboard sleeve. 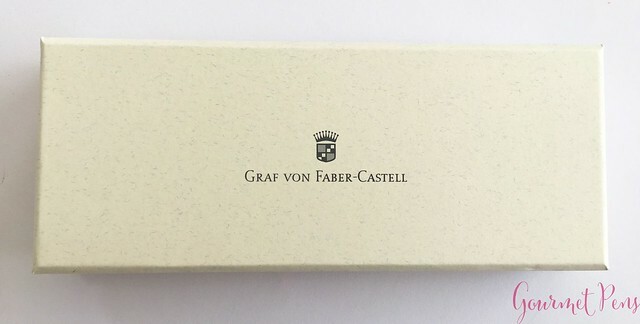 The box is quite elegant, in Graf Von Faber-Castell style. The lid is removable and is off white with little grey squiggles, with Graf Von Faber-Castell and the logo on top. The base is a whiskey brown, and holds a felt lined tray, the plastic wrapped pen, and a GvFC notebook/pamphlet. Lovely packaging. There is little extra space, a box base that is actually attractive and useful - because the top lid can be removed entirely and the base has a three pen holding slot in it. The lid can be inverted then used to hold various smaller items - ink cartridges, a converter, a small bottle of ink, etc. I was expecting something like the Faber-Castell Ambition, but this Graf Von Faber-Castell is much nicer than the Ambition. 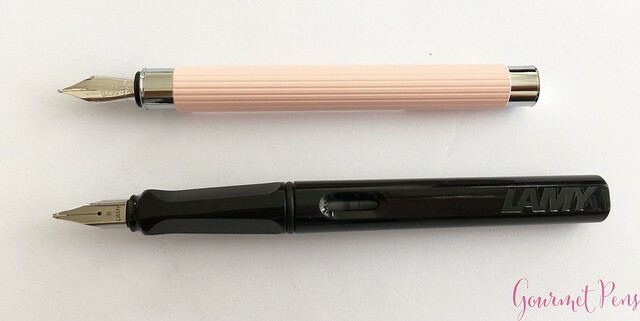 I like the Ambition, but the overall look and feel of this pen is an improvement. The cap is short and round, in a gleaming polished chrome. The cap widens towards the top, and has a rounded top. The finial dips in, like a small fingerprint. 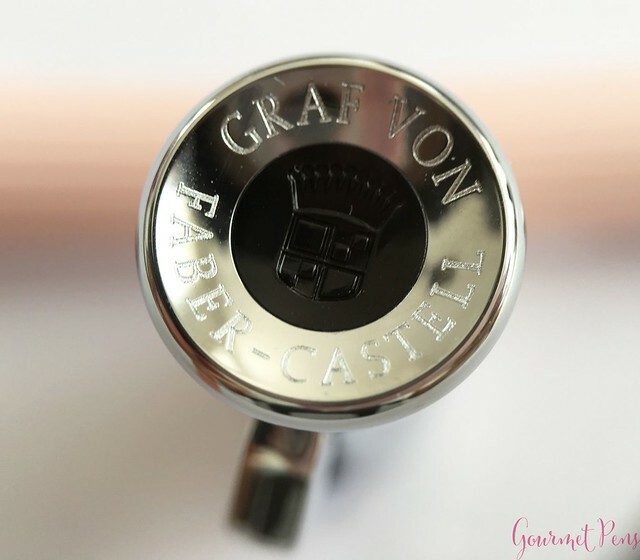 The middle of the finial valley has a black Graf Von Faber-Castell logo set in the chrome top. The ring around the black plug is engraved with: Graf Von Faber-Castell. The small, plain spring-loaded clip is attached internally through the cap. It is a very clean, snug connection, and it looks well made. The base of the cap ends in a blunt end, and is engraved with "Handmade in Germany". The front and back of the barrel has two chrome plugs that flank the barrel. The front plug is sort of a section, but we'll get to that later. The end plug has a little dip in it as well, which matches the finial. These little dips are so cute. 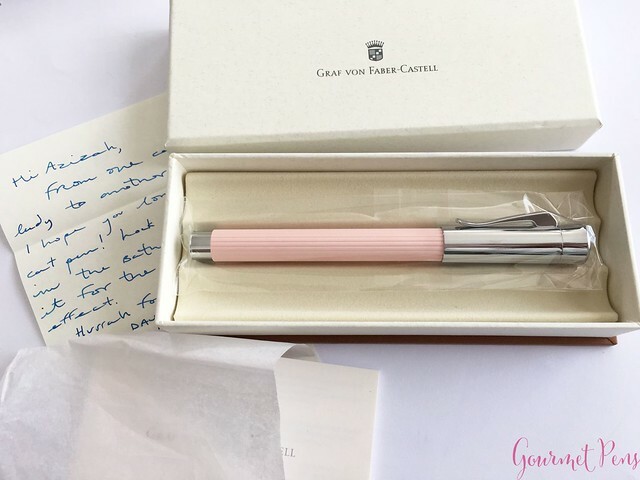 I have always loved Graf Von Faber-Castell for that - the finial and end plugs are cute and satisfying to pet. The barrel is round with fine flutings on it. The barrel is metal and is lacquered to create the matte surface. The soft, rose pink barrel is beautifully complemented by the highly polished cap and end pieces. 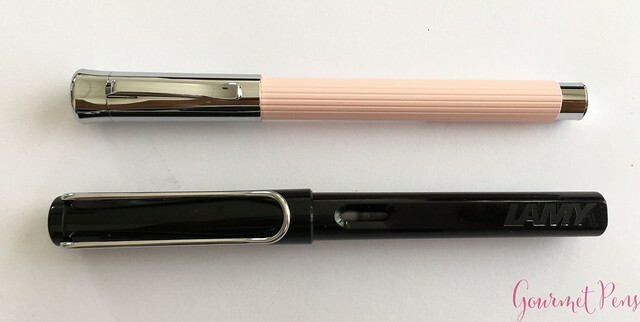 A huge step up in elegance from the very cute and humble Faber-Castell Ambition OpArt. I really love the super shiny polished chrome cap, but it picks up grease and looks grimy if it's not wiped regularly. This medium nib is a steel nib, but it is rhodium plated so that it matches the polished metal of the pen. It's a pretty good looking nib, too - it has a single slit and no breather hole. 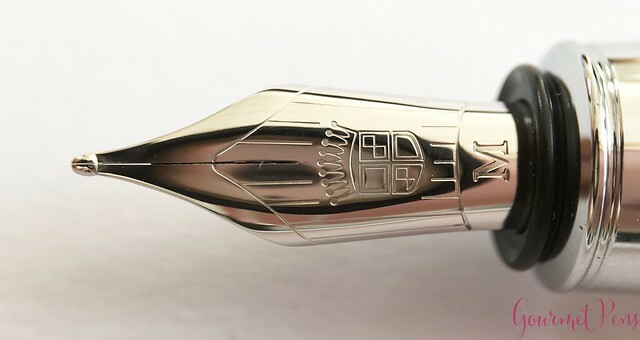 It is engraved with the Graf Von Faber-Castell logo, the nib size (M), and some lines that resemble a mini nib shape. The rhodium plating really adds to the appearance, making the nib bright and shiny. It's a beautiful package. This is a smooth, very pleasant writer. It is not very wet, and drying times are pretty fast. It does not skip or hard start, and it keeps up well with fast writing. It also passes the free weight test, putting down a line of ink with no pressure, just based on the weight of the pen in hand. With normal writing, the nib is on the firm side, but it does not feel like a nail. With moderate pressure, you can squeeze out some broader liners as well, but it's not that great. 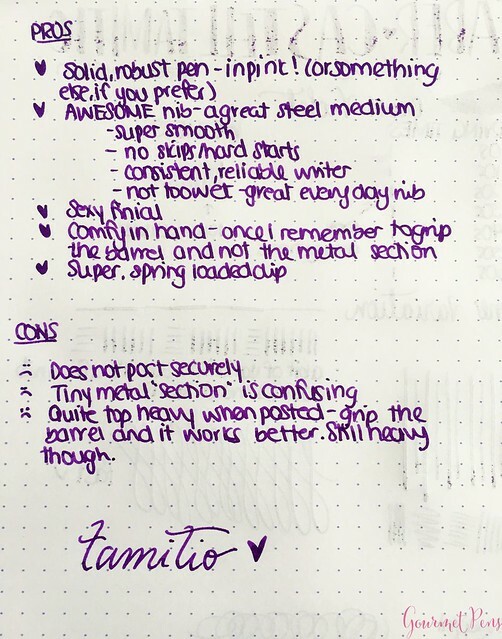 Works well as a fast writer, and it doesn't dry out during use. This nib reminds me of the Faber-Castell eMotion pen, which has the smoothest broad steel nib I have ever used. This one is smooth, has almost no feedback, and is something that is very enjoyable to write with. The international converter in the pen works just fine as a filling system, especially since the nib is not a gusher. Easy to clean and easy to fill. No fuss. Another Graf Von Faber-Castell feature to love - the really easy to use spring loaded clips! The clip is small, but is snug, and it can easily be slid on to and off pages, pockets, and pouches. The pen is fairly heavy, but the clip is snug enough to keep it secure. Ah, the section. A beautiful pen with a somewhat confusing section. 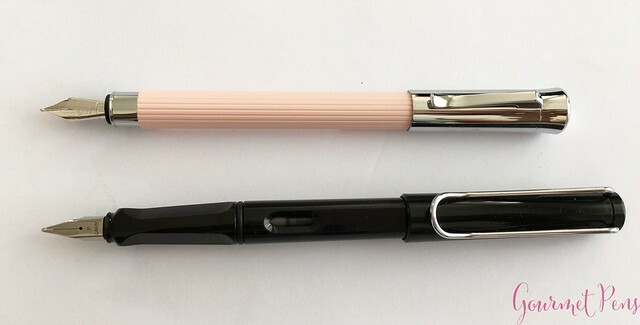 The little polished piece between the nib and barrel is presumably a design element, and one is intended to grip the lower part of the barrel. That little piece is quite slippery, even if you do hold it. The section comfort ties in with actually holding the pen, and if the weight and balance works for you. Unposted, the pen feels solid, robust, and is fairly heavy. It a little short if you grip the lower barrel, and not the metal piece. The cap can be posted, but it does not feel very secure. It's snug enough to write with but if you move suddenly or drop the pen, it can fall off. However, posting it evens out the length and balance enough to allow one to more easily grip the barrel as the section, especially those with larger hands. This works well enough, but requires some attention to posting the cap so you don't cause it to fly off. Strange. 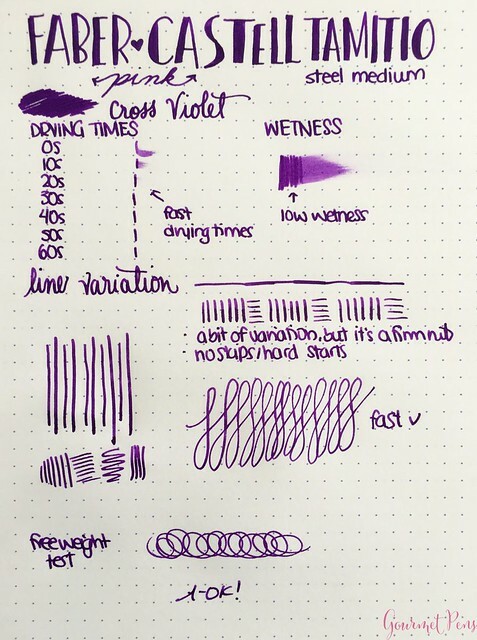 I had similar issues with the Faber-Castell Ambition OpArt, but this pen is heavier so it feels more comfortable and balanced. This might be a try before you buy, unless you intend to use this for shorter writing sessions, as I do. What a gorgeous, elegant pen with some great qualities - awesome finial, beautiful colors and finish, well made, great nib... but odd section. If this will be your only pen, see if you can try it first to make sure it works in hand for you, or buy it knowing it may be for shorter writing sessions. What do you think? Have you used these pens? I received this pen free of charge for the purposes of this review. Although Pen Boutique is a sponsor of this blog, I was not compensated monetarily for this review. Everything you've read here is my own opinion. There are no affiliate links in this review.